I often think with nostalgia on times when communities were vibrant and people helped each other through challenges. We can have that today! I’ve seen the possibility that this can exist again, with an unparalleled vibrancy, if we want it to. Not only is growing your community incredibly rewarding, it’s FUN! Nothing can replace the human connection brought through direct and personal interactions with people. The more we can strengthen our community interdependence, the more we grow and thrive individually and as communities. Building local networks, adding to those already in your community, this helps us all. Community strengthens the bonds between individuals, and grows our desire and ability to nurture peace, freedom, and prosperity. Here are some of my favorite ways to grow community. What are some of yours? Take a look through the list, see what connects with you. Maybe you can try a couple or add your own. Not everything is for everyone, but there is something for anyone! 1. Plant sunflowers in your front yard. 2. Grow a garden anywhere. Your yard, neighbor’s yard, friends house. Anywhere someone will let you grow. Start small if you’re new. 4. Take flowers to an elderly neighbor. They will love it. 5. Take a walk and say hi to everyone you see. 7. Volunteer. Give some time to someone else today, whether it’s a homeless shelter or yard work for a friend or neighbor who has trouble doing something themselves. 8. Make dinner and share it with someone. Just because. 10. Call someone and tell them how awesome they are. Sounds too simple, right? It’s not. People love to know that you’re thinking about them. A colleague you no longer work with, a friend you’ve lost touch with, anyone you think of fondly. You’ll feel better too. 11. Share your stuff you don’t want anymore. Bless someone else with something they could really use. Freecycle or the equivalent is perfect for this kind of exchange. Plus, it reduces waste. 12. Share food from your garden (see #2 above). 13. Set up a lemonade stand with your kids. 14. Free hugs. Need I say more? 15. Smile at everyone. Even if they don’t smile back. Everyone is on a journey. 16. Love. Just love. And tell someone you love them. 17. Say, “Yes!” every chance you get. See what is possible today, tomorrow, the next day. Then watch the results. 18. Invite someone out. Just for fun. Or treat someone to lunch. 19. Ask people how you can add value to their lives. Then listen. Then act. 20. Help with children. Moms are generally exhausted. Ask a mom what kind of support she needs. Or ask how you can add value to her life. Listen. And then act. 21. Read a poem. Out loud to someone. Poetry not your thing? Maybe something more like this? 22. Give someone a ride. Or offer to pick them up next time they need a ride back from somewhere. 23. Share. It’s fun to share. If it’s tough at first, start small. Consider the cost and material efficiency we could return to if people shared as they once did. 24. Book swaps. Like a community traveling library. Only better. No late fees. Finish a book? Pass it on. Need a book? Ask. 25. Got a talent? Share it. Play music outside, join a theater, teach a cooking class, the possibilities are endless. Sharing our talents light up the world! It is beautiful to witness people living their purpose. This is only a partial list. There are millions of ways to grow community. 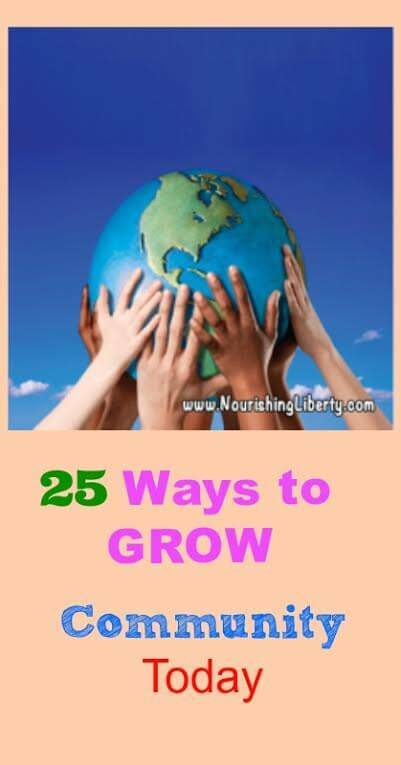 What are some of your favorite ways to grow and nourish your community?